It is always so much fun for fall to arrive, with all the beautifully shaped and richly hued pumpkins, gourds, and vegetables at roadside farmers markets and produce departments of local supermarkets. Just a walk in the woods reveals jewel-toned leaves, branches, and berries to gather and add to the pumpkins and gourds to create welcoming doors and entrances, harvest arrangements, and bountiful tablescapes that will remain beautiful throughout the season. Add the Midas touch to your harvest array with just a little time and effort, and achieve an amazing impact. 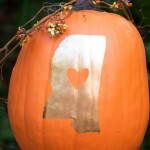 And the golden Mississippi with a heart on a pumpkin will glean the attention of all your guests. 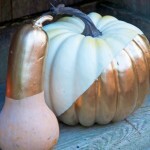 Only a few supplies are needed to transform ordinary pumpkins and gourds into gleaming beauties. 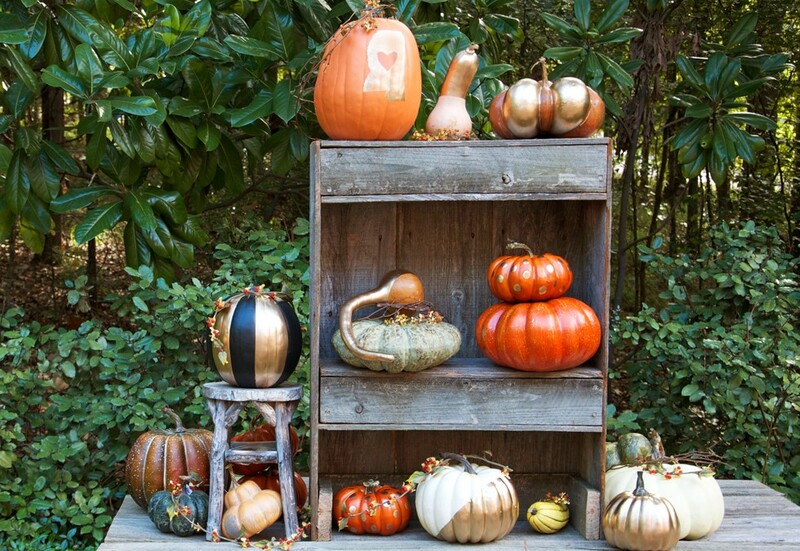 These amazingly real-looking faux pumpkins and gourds were discovered at Annelle Primos and Associates in Jackson, Shipps’ Flowers in Brookhaven, and Hobby Lobby in Flowood. The fresh bittersweet is from The Fresh Market in Ridgeland, and the handmade weathered wooden shelf is from the Flowood Flea Market in Flowood. For the Heart Mississippi pumpkin, download and print the template (here). Cut out shape of state first, and then the heart within it. Secure it to pumpkin with straight pins. Trace around state and interior heart with a fine-tip gold marking pen. When dry, carefully remove template, and paint in the shape of the state, excluding the heart in the center, with a small paintbrush and Liquid Gold Leaf paint. Allow to dry for 24 hours, and spray with a very thin coat of spray varnish according to directions on can. For pumpkins and gourds with diagonal painting, place blue painters’ tape to line the area to be painted. Press tape down carefully and securely into each groove to get a straight line. Use a small paintbrush and Liquid Gold Leaf to paint the desired area. Allow to dry for several hours before carefully removing blue tape. Dry for 24 hours and spray with a very thin coat of spray varnish according to directions on can. For dotted pumpkin, dip a small round soft-tip stencil stick or sponge into Liquid Gold Leaf paint and carefully place dots randomly on pumpkin. Allow to dry for 24 hours, and spray with a thin coat of spray varnish according to directions on can. 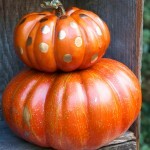 For splatter pumpkin, dip a stiff medium-size brush into Liquid Gold Leaf paint, and splatter paint over pumpkin. Allow to dry for 24 hours, and spray with a very thin coat of spray varnish according to directions on can. 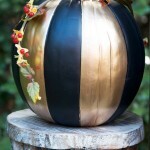 For vertically striped pumpkin, paint every other section of the pumpkin with a small brush and Liquid Gold Leaf paint. Allow to dry for 24 hours, and spray with a very thin coat of spray varnish according to directions on can.